(Nanowerk News) Researchers at the University of York have developed a new sensor that is capable of detecting multiple proteins and enzymes in a small volume of blood, which could significantly speed up diagnostic healthcare processes (Nature Communications, "The electro-photonic silicon biosensor"). If multiple tests are required, as is the case in the suspected presence of cancer cells or resistant infection, the delivery of results can take longer and the costs of testing increases. 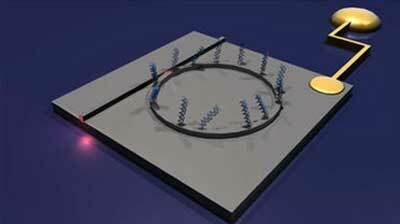 The team at York, however, have developed a biosensor that combines light and electricity, to detect multiple disease biomarkers in one smaller sample of blood. The technology could make blood tests more comfortable for patients and enable results to be processed quicker. Professor Thomas Krauss, at the University of York’s Department of Physics, said: “These sensors can give fast, real time results and at low cost. The length of time and money that it takes laboratory technicians to identify just one protein in a patient sample is a real challenge for the NHS and can result in emotional distress for patients. Researchers are now looking to test the new technology in urine samples for urinary tract infections (UTIs), which has a high resistance to antibiotic treatment. If the biosensor can identify biomarkers of the infection and of resistance, it is more likely that the correct course of antibiotic treatment will be prescribed the first time around, rather than on repeat visits, which is often the case with UTIs. The emergence of stratified and personalised medicines – the tailoring of treatments to the biology of the individual – has increased the demands on diagnostic technologies, particularly with healthcare challenges related to anti-microbial resistance. PhD student, Jose Juan Colas, who conducted the research at the University’s Department of Physics, added: “This new diagnostic technique could have many applications and really pushes us forward in how we think about developing technologies for the future.